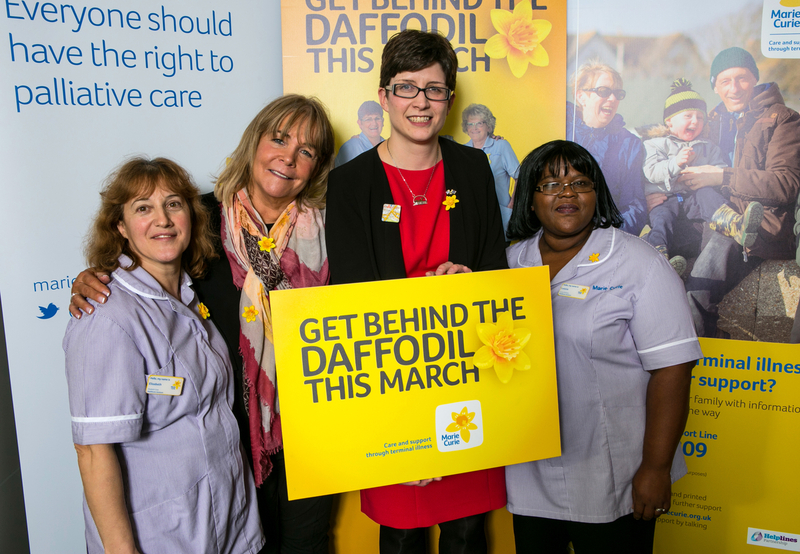 Glasgow Central MP, Alison Thewliss and actress and presenter Linda Robson have joined forces to ‘get behind the daffodil’ this March and help Marie Curie Nurses provide care and support to people living with a terminal illness. Alison Thewliss and Linda Robson were pictured together with Marie Curie Nurses, Leonie Christian and Elisabeth Goze, at a parliamentary event in Westminster to celebrate the launch of the Great Daffodil Appeal, Marie Curie’s biggest annual fundraising campaign. Ms Thewliss pledged her support to the appeal and is encouraging local people to help the charity raise more money than ever before by simply giving a donation and wearing a Marie Curie daffodil pin, available from volunteers across the country, or Superdrug and WH Smith’s shops, and Wyevale garden centres, during March. Ms Thewliss said: “Marie Curie carry out hugely important work in supporting people who are suffering from terminal illnesses. They are a fantastic organisation and I will be wearing my daffodil with pride this March”. “Having the support of Alison and Linda makes a huge difference to Marie Curie in terms of raising awareness about what we do and helping us to reach more people who need us.